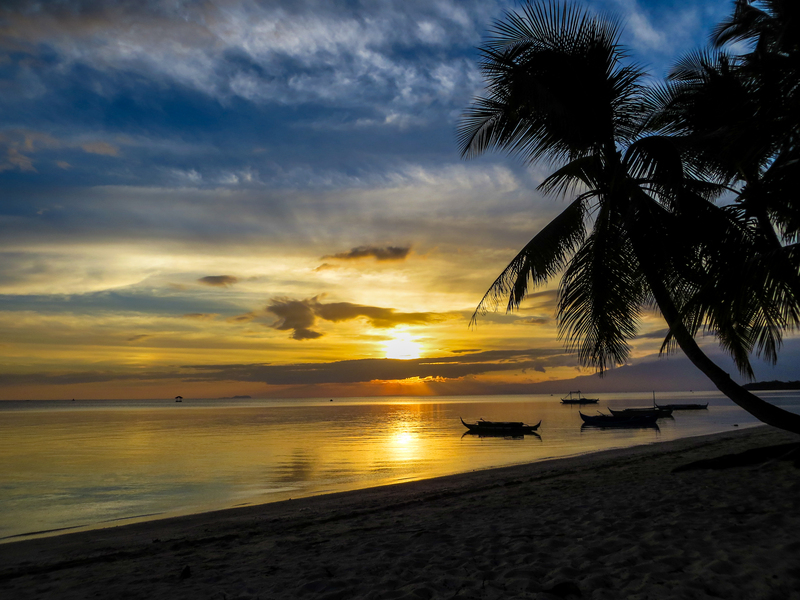 The Philippines will forever conjure up fond memories for us, and not just because of the awesome beaches and sites, but to a big deal the PEOPLE themselves. Their hospitality, friendliness and curiosity is unequaled in any other S.E.A. country (IMO). This was our third (def not last) visit to this awesome archipelago, and every time it feels like ‘it can’t get better than this’. We had 11 days, during which our main focus was scuba diving and getting in some beach time. 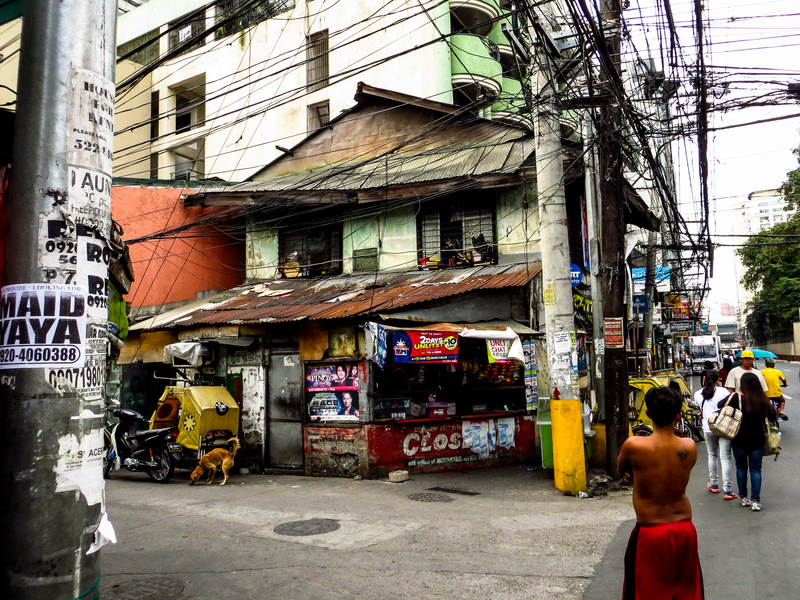 We started off in Manila, and was pleasantly surprised by how much we ended up enjoying it there. We opted to stay at the ‘Pink Hostel’ (quite popular), and it was a wise decision. Our main reasoning being that hostels always know ‘where to go/what to see’, and you can meet cool travellers with interesting stories. We don’t frequent hostels (we got a private room anyways), and usually opt for a bungalow or private room, but we had a great time nonetheless. This can be confusing (especially in high season with many people around), you have a few options. 1) If you know where you are staying (recommended), take a taxi. There are different ones though: normal, white metered taxis are the best and cheapest. Then you get the ‘airport taxis’, which run on a fixed rate depending on the area you’re going to. They are really expensive – if you choose them, try to get people going to the same area and fill up a taxi (we met people, not knowing better, who payed PHP1400 to get to the hostel with the airport taxis, whereas it only cost us PHP 35 each…). 2) Take the airport shuttle. The shuttles run to different areas also (can get to LRT or MRT with shuttle). We did this. 3) We knew the subway (LRT) stop we needed to get off, so we took the shuttle (PHP 20) to the LRT station (first station), bought a ticket to our LRT stop (PHP15) and walked to our hostel. Getting to the airport from anywhere in Manila is much easier. Just make sure the taxi runs a meter – it’s a rather cheap trip back. They run through the night – we had to get to the airport one morning at 4am, no problem getting a taxi at that time. 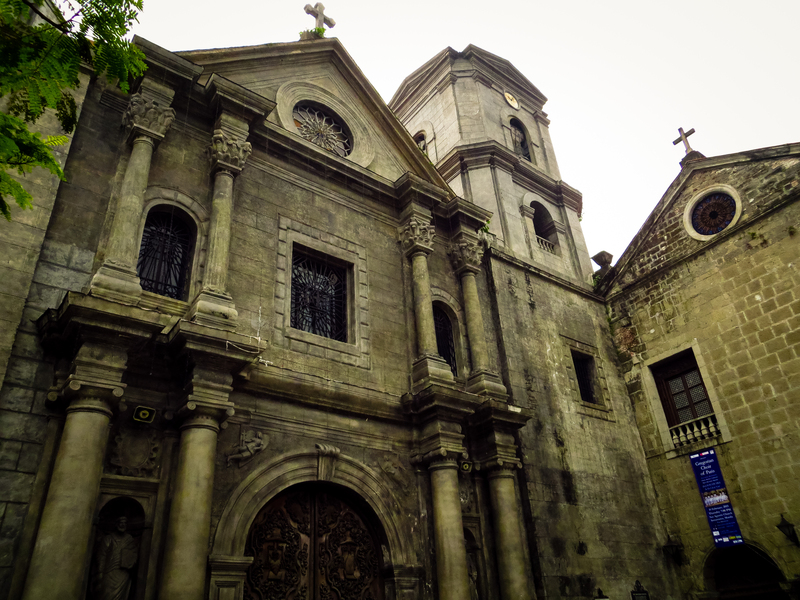 – Visit Intramuros. 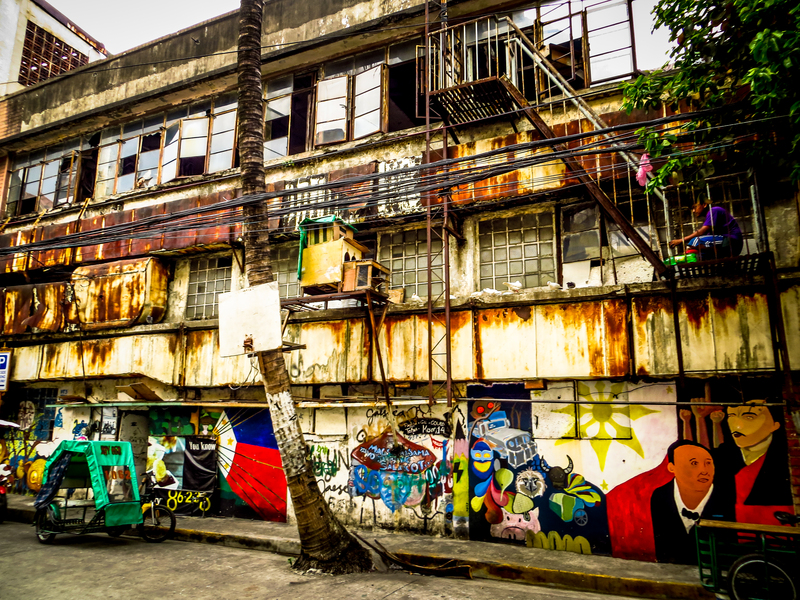 This is the oldest district and historic centre of Manila. Also known as the Walled City, it is an interesting area to just walk around at your own pace and explore. The architecture is beautiful and gives a glimpse and feel for when the Spanish empire ruled here long ago. – Walk around China Town. 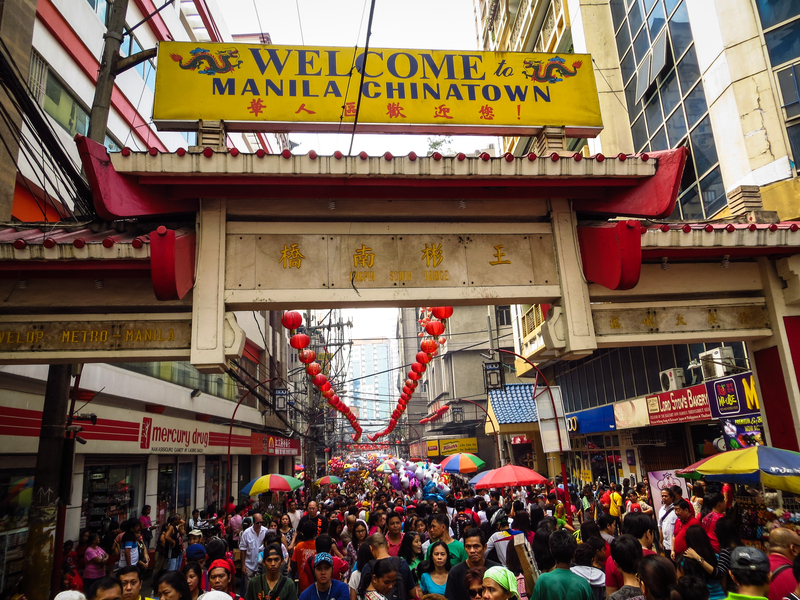 It’s possible to walk to China Town from Intramuros, just ask around for directions (friendly locals) – you’ll cross the big bridge and walk right into it… We were there precisely during Chinese New Year’s Celebrations, and to say that celebrations were energetic, chaotic, and loud would be an understatement! Think thousands of people, strings of firecrackers, banging of drums, dancers in flamboyant costumes, merchants selling their wares, and A LOT of noise (also street kids trying to get their hands in your pockets…). 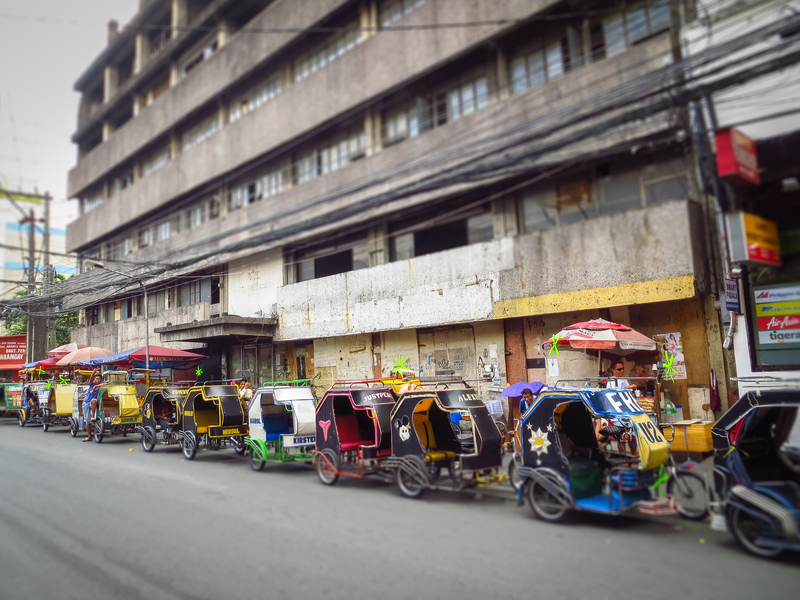 – Use the jeepneys, travel like a local. It’s a fun way of getting around, it’s cheap, chat with the locals. – Do some shopping at Mall of Asia and Robinsons Mall. Due to our plans, we had a lot of time to spend in Manila – TO THE SHOPS (guess who suggested it?! If you have time, watch a movie (the cinema in Robinsons mall is huge). – Hold your breath on a tricycle ride. Want to live dangerously (or exciting – depends…), get on one of these. It’s a fun way of experiencing the traffic, zipping around other vehicles and seeing everything from a different view. Definitely agree on a price before setting off. Our flight from Manila to Dumaguete was an interesting one… It’s the first time one of our flights had to be redirected. Due to the thick cloud cover over Dumaguete, the airplane couldn’t land, and we were redirected to Cebu airport. After quite a bit of waiting, we just decided to get off there and bus down to our destination, Moalboal. If it wasn’t for our carry-on luggage, it wouldn’t have been possible to get off the plane. We literally walked of, got escorted past the other planes and walked into the airport – carry-on FTW! We were headed south, so we took a taxi to the ‘South Bus Terminal’. Don’t take the yellow airport taxis, they’re more expensive (so we were told). Just walk out, over the road, up the stairs to your right, and queue with the other locals for the white metered taxis. At the South Bus Terminal we got on the next bus leaving for Moalboal (they’re quite frequent). You get on the buses here, and a conductor walks around collecting the fare. Be careful though – you get some sly conductors. He told us the ticket is (what sounded like then) PHP 160. I payed PHP 320 for us both. Later, it bugged me, and looking at the ticket again, I realised it should have been one hundred sixTEEN (PHP 116). Sneaky sneaky… He never tried to correct me or give me change. The bus ride takes around 3 hours. You will be dropped at Moalboal market area in town. 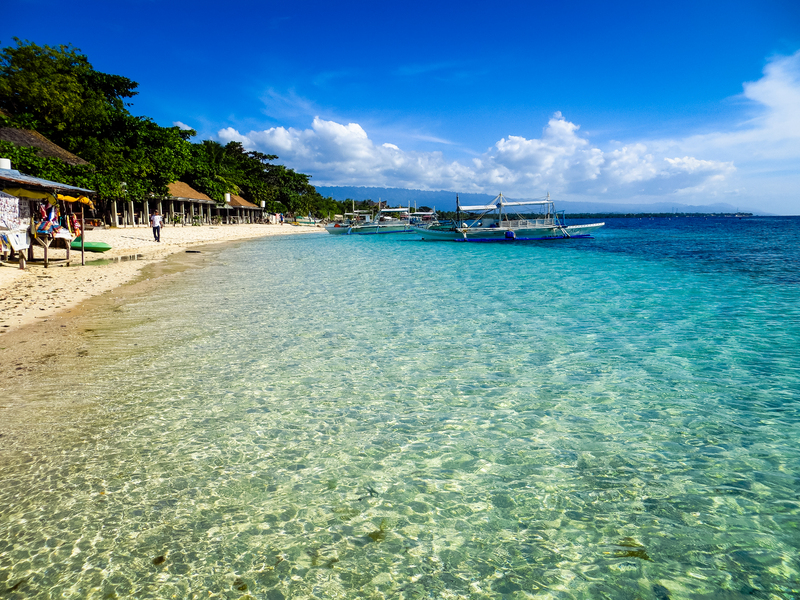 UNDERSTAND this of Moalboal: there are 2 different areas, not within walking distance from each other – Panagsama Beach and White Beach. 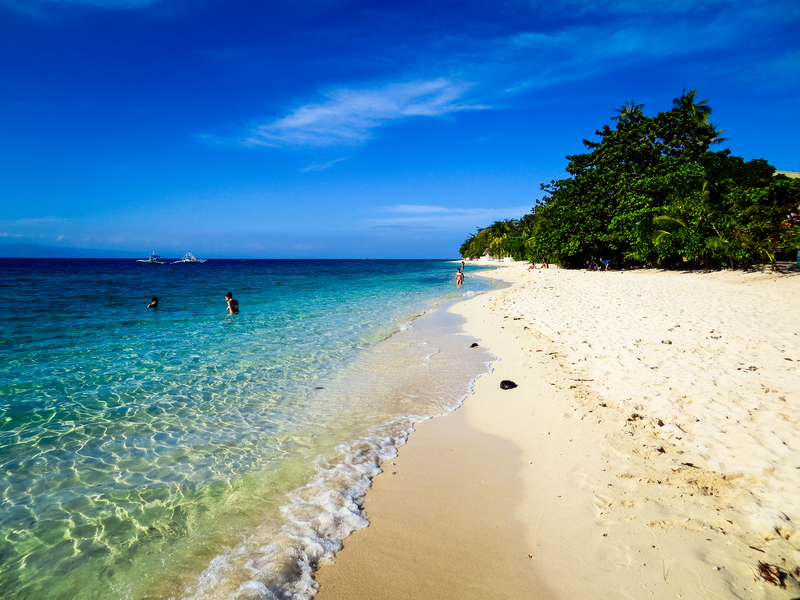 Panagsama Beach (no actual beach) is where the most resorts, bars, restaurants and dive schools are. A tricycle here is between P 50-150, depending on your bargaining skills. 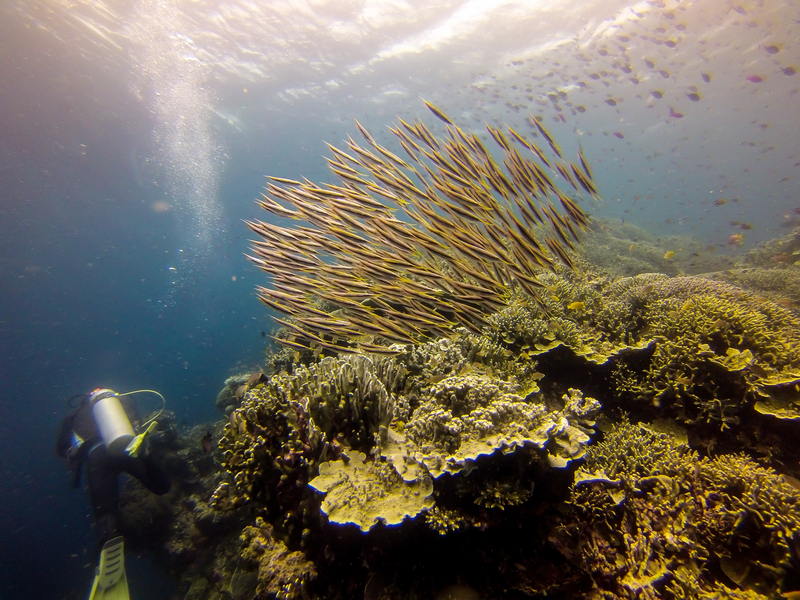 Snorkeling is easily done from the shore – the reef drops off only 20m from the shoreline! 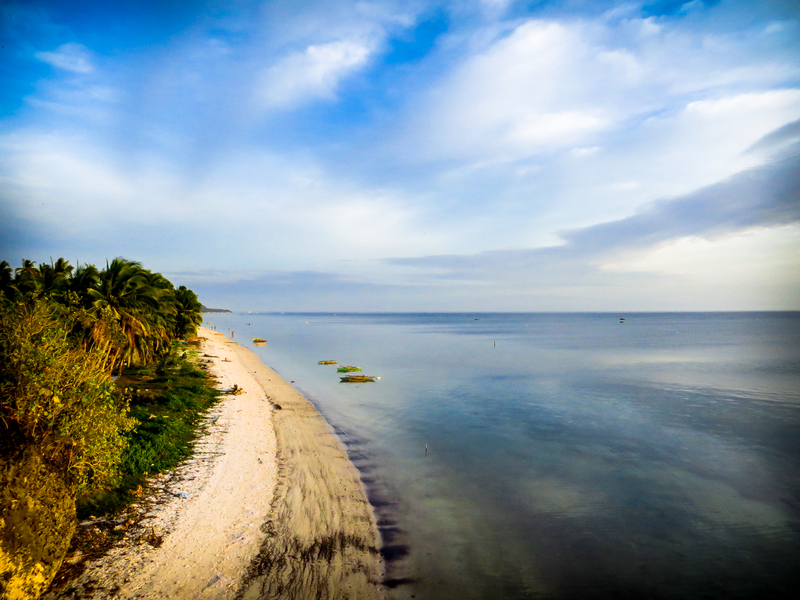 White Beach is exactly as its name states – a beautiful stretch of white sand, great for swimming and also snorkeling from the shore (beautiful coral!). You’ll have to ask yourself why you wanna go there: diving or for a beach (with diving on the side). 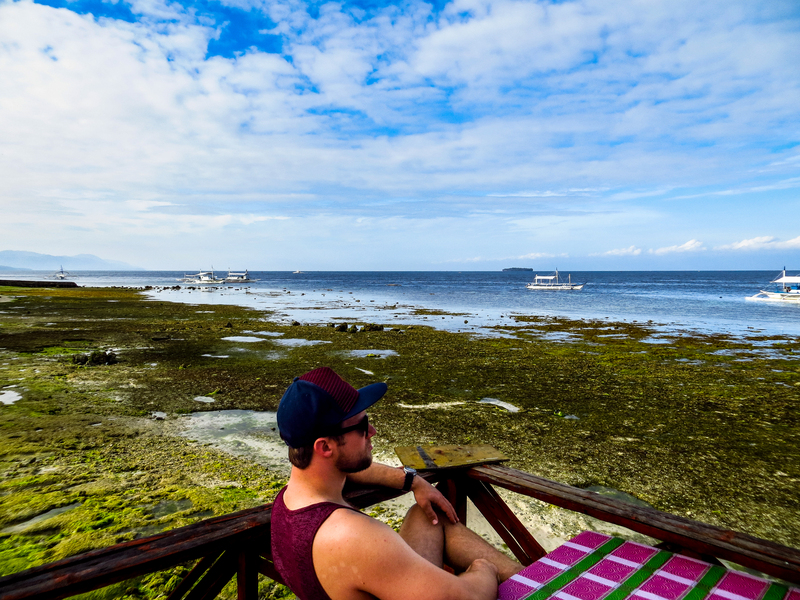 In Moalboal itself there isn’t too much to do, but it’s the perfect basecamp for diving and to explore the outlying area. 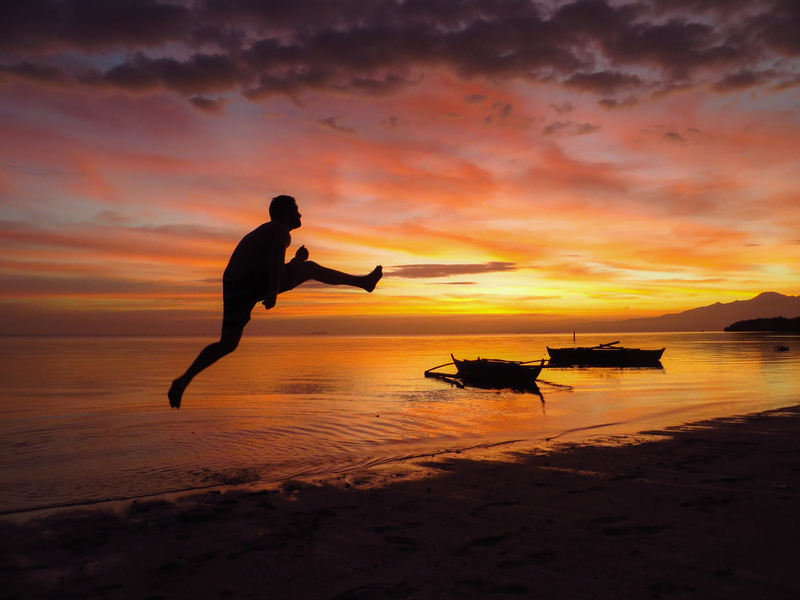 We stayed in Moalboal for 4 days and never got bored. We put in some beautiful dives. 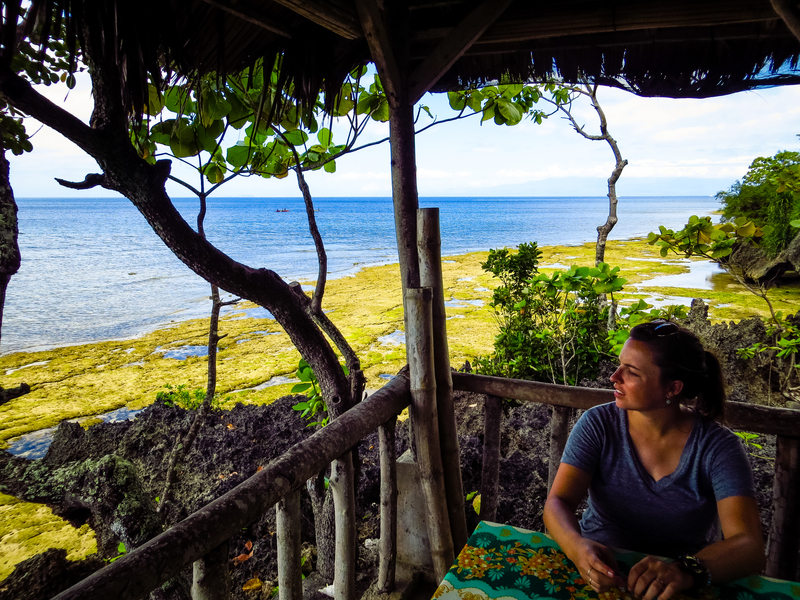 Most memorable scuba moments: seeing a pygmy seahorse, lots of turtles, large school of sardines, seeing different coloured and sized frogfish, and diving the awesome walls of Pescador island. 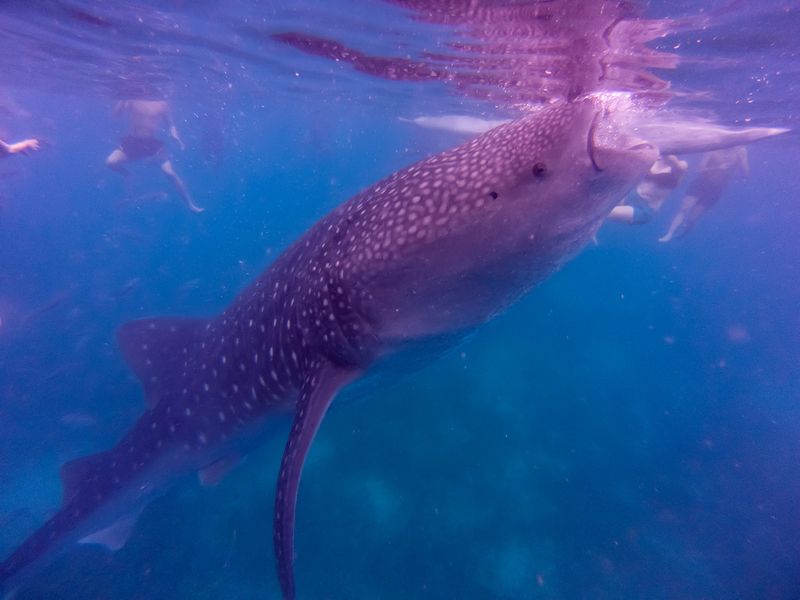 We also couldn’t let an opportunity to dive with whale sharks pass us by. We took the bus down to Oslob early one morning, where we snorkeled with the majestic leviathans for a short while, and were finished already at 8:30am. It’s a thrilling experience to come face-to-face with these animals, and to get a sense of their size by swimming next to them. They are truly beautiful and unique creatures, but the way of the whole operation doesn’t sit too well with us. Firstly, there is a net keeping the whales in a certain area – so there you go, they’re basically held captive in an outdoor aquarium. Secondly, they are being fed krill (their natural food) by hand off of the bankas (paddle boats). This practice has surely disrupted their natural feeding patterns. They are totally dependant on humans for food now. I get the image of a dog sitting on its hind legs with its tongue hanging out because he knows it’s feeding time… The fact is that most of them are still juveniles, and this is the way they feed day in and day out – how do we know the impact this practice will have on them when they have to fend for themselves out in the open ocean? Everybody has their own opinions, but I believe a wild animal belongs in the wild, with no nets or restrictions… And I do know about the past where they were hunted for meat by the locals. So, is this the lesser of two evils? I guess. There is a certainly a good debate in there. 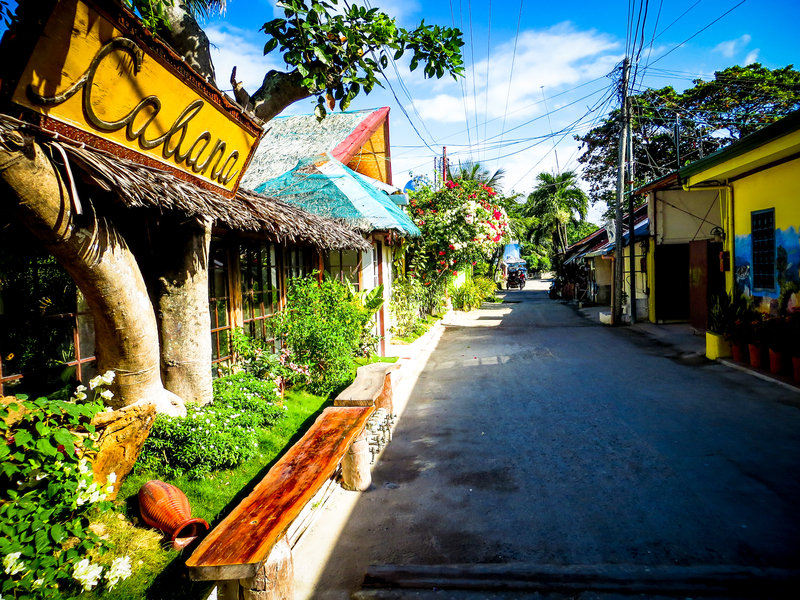 – Take tricycle at 4am to Moalboal market. Get on bus heading for Bato (ticket is P70). Bus takes 1h30min. Stop at Ceres Liner bus terminal. – Get on next bus (wait for about 10min) to Tan-Awan (Oslob) (ticket is P45). Takes only 20min. – Walk to ‘Briefing Center’, the main office of the whole whale shark experience. Get short briefing on the do’s and don’ts. Pay the fee (P1000/person). Fee includes boat out, lifejacket, mask & snorkel. Fins can be rented for extra P50. – You go out with boat and get a 30min ‘encounter’ with the sharks. – TIPS: go early to avoid the hordes (we dove at 7am, already many people). Go on weekdays, it’s apparently quieter. – There are also free showers and toilets to be used, and there is also a kind of locker (huge wooden cupboard, manned by a guy) to stow your day pack in. 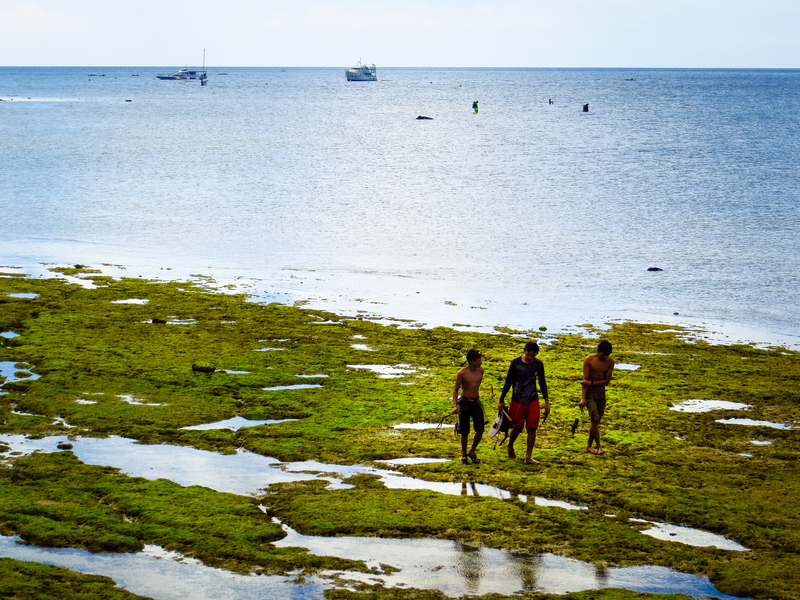 – There are souvenir shops and nice restaurants right on the shore to have breakfast after your snorkeling experience. – Get a bus back to Bato – they pass roughly every 30min (we payed P20, non-a/c, local bus). At Bato bus terminal, get on next bus heading to Cebu via Moalboal (ticket was P75 – a/c bus). After arriving back at the market area in Moalboal, we hired a scooter (P300/day). We used it to visit the Kawasan Waterfalls. It takes about 30min to get there (20km). 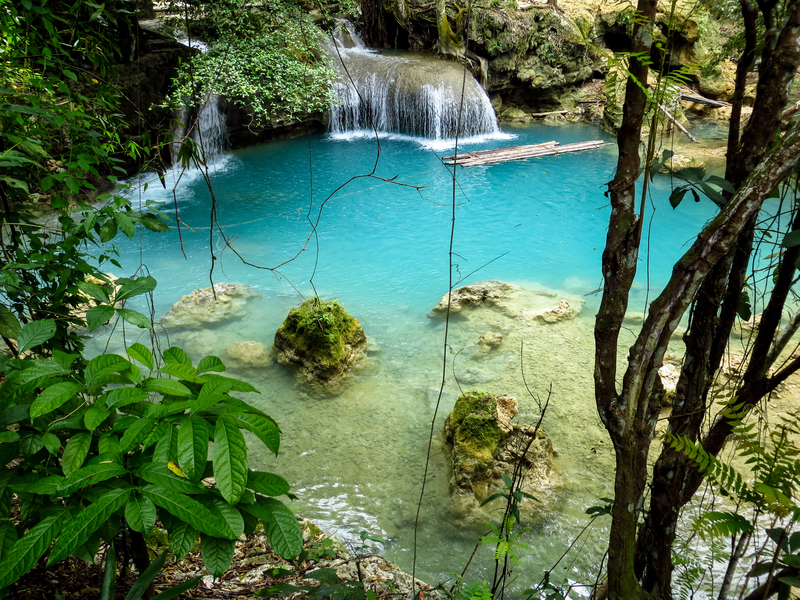 We took a refreshing swim in the ‘main’ pool and swam in behind the cascading water. It was awesome being back again after 4 years, and to stand once again at the spot where I proposed to my beautiful wife, under a waterfall in the lush green jungle! Coming back from the falls, we visited White Beach (there’s actually an entrance fee of P5 on the road in). 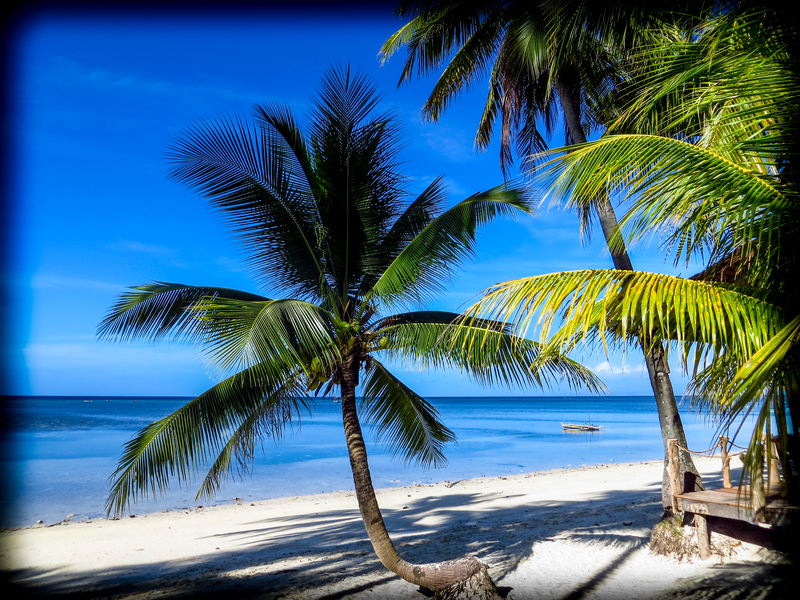 It’s a stunning stretch of beach, with great snorkeling right off of the beach with beautiful, healthy coral. You can even buy a few cold ones right there at some stalls. 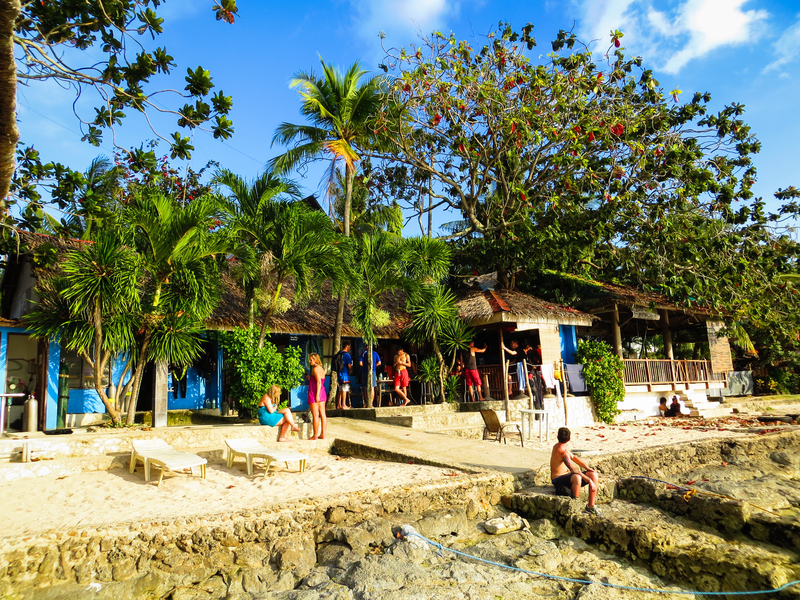 We stayed at Cebu Dive Center (CDC), and can’t recommend them enough. 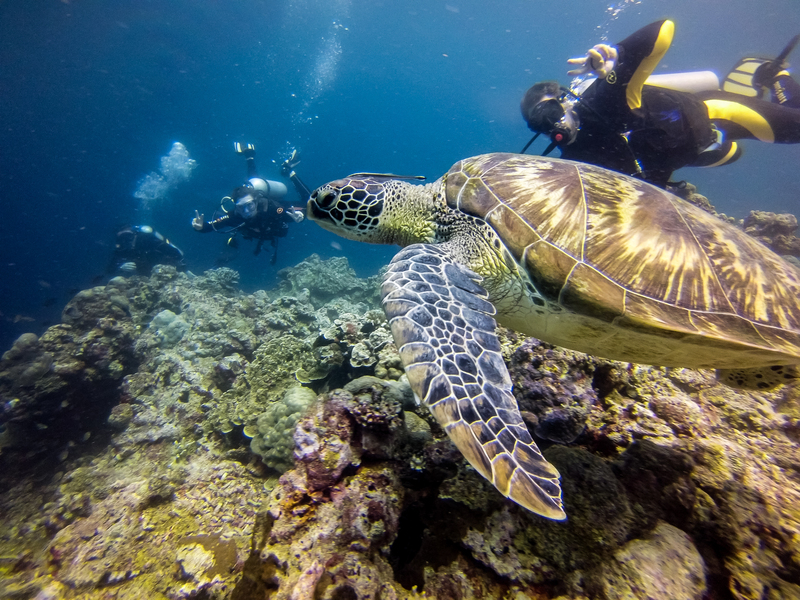 The service, the personal touches, the small groups, the equipment, the divemasters/instructors (cheers to Bro, what an awesome dude), the vibe – everything TOP notch. Place not to miss: Little Corner Restaurant – we ate most of our meals here, it’s on the sea, awesome views, friendly service. (Chili Bar is a hot spot, but too busy for our liking). Little Corner Restaurant = Meal with a view! 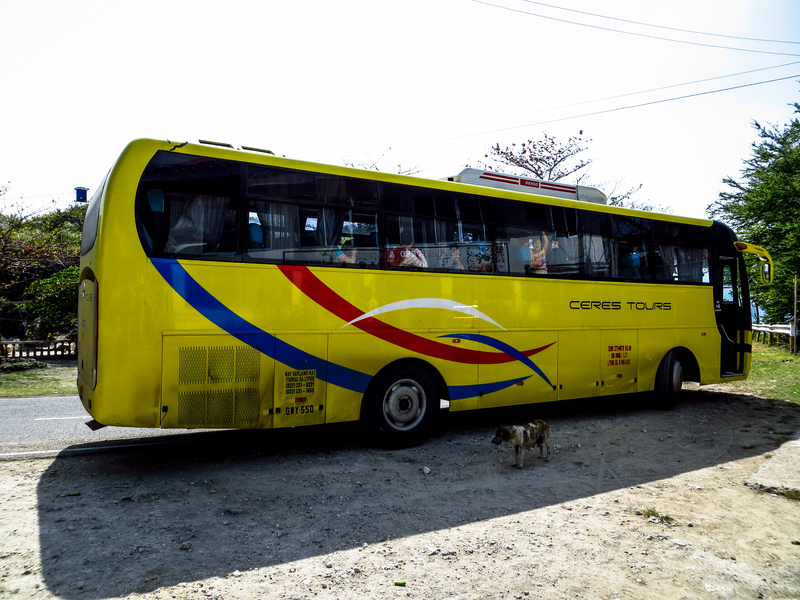 – Get on passing Ceres bus heading to Bato (P70, 1h30min). 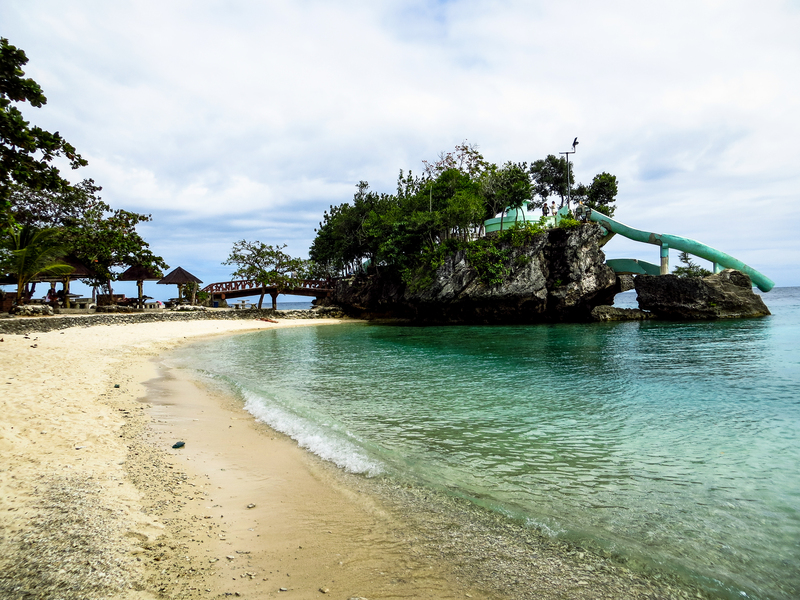 – Bato to Lilo-An port (southern part of Cebu) took 10min with a tricyle (P75). 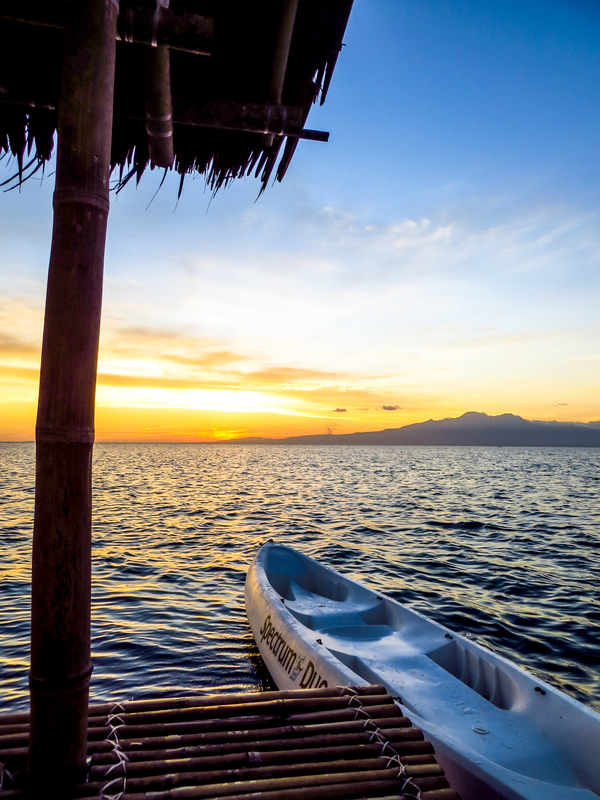 – Lilo-An to Sibulan port (Dumaguete) takes 20min with ferry (P62/person). 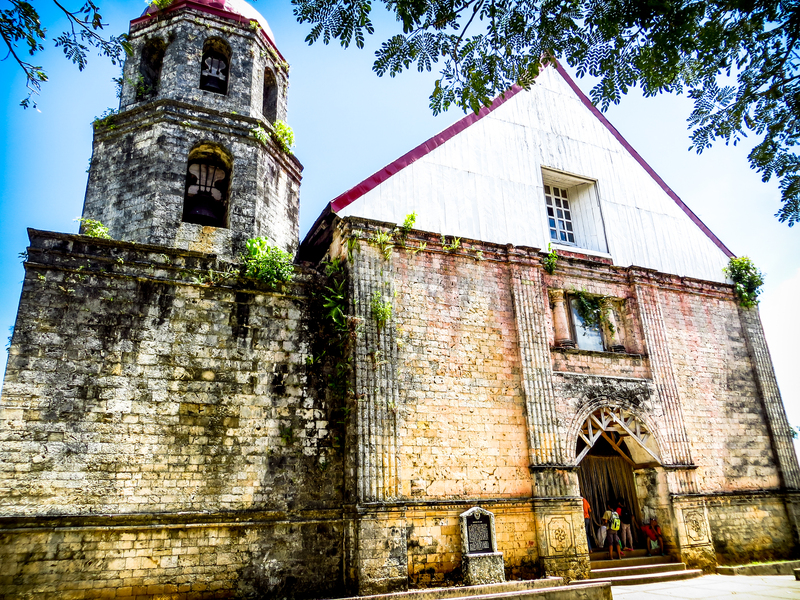 – Sibulan port in to Dumaguete city takes 15min (P11/person) with a small jeepney. 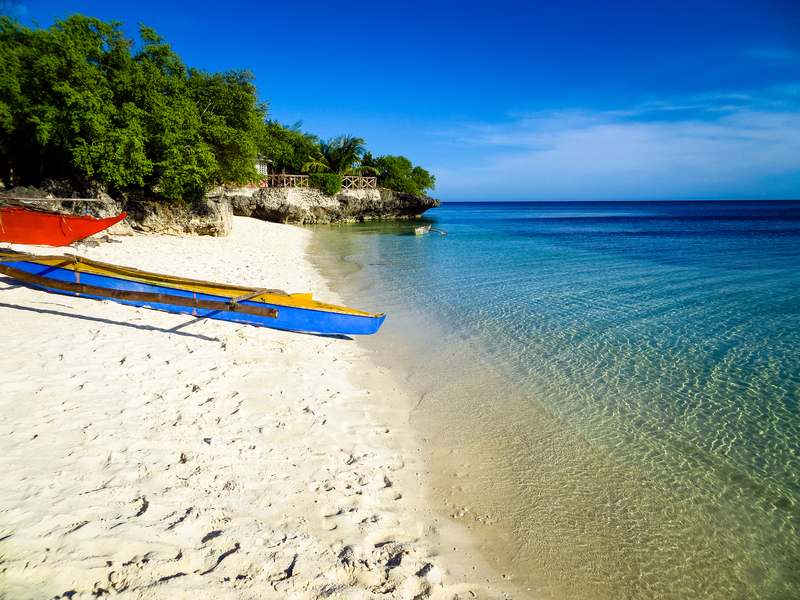 Make sure the driver knows you want to go to the port leaving for Siquijor. They drop you in a street that runs directly to the sea. Turn left once you hit the ocean, you’ll see the port in front of you (around 15min walk from drop off). – From Dumaguete port to Siquijor, we used GL Shipping Lines. It’s a slower ferry and takes about 90min, but comfortable ride. (You pay P12 terminal fee. Ferry ticket is P130/person). On arrival, we hired a scooter for our entire stay. This is highly recommended. It gives you freedom to explore wherever you want to go, and is cheaper than using the tricycles for single trips… They add up. 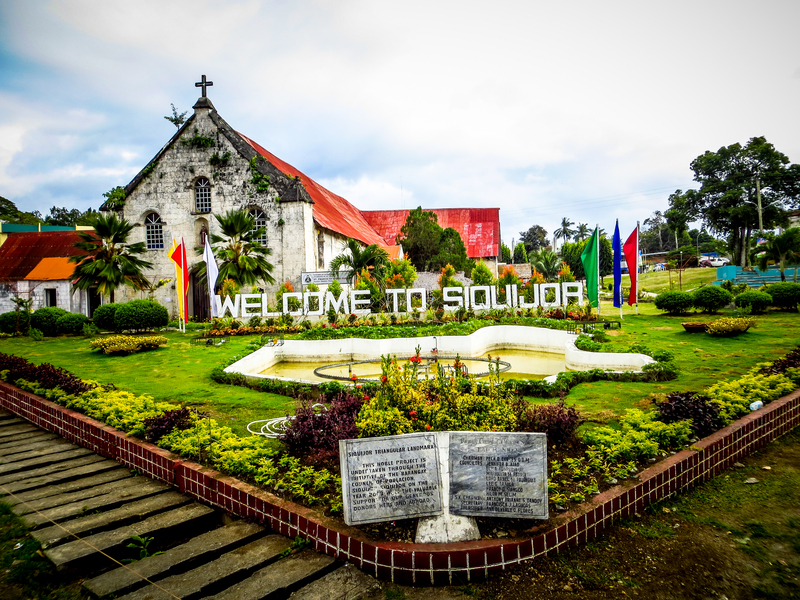 Also, Siquijor has well kept roads, and the traffic is really light, making it reasonably safe (that’s if you know what you’re doing on a bike). We organised our last scuba diving of the vacation with the dive shop Last Frontier. Visibility isn’t always that great due to sandy bottom, but we still had fun. One morning we set out on the scooter to ride the loop around the island and check out the most popular sites. 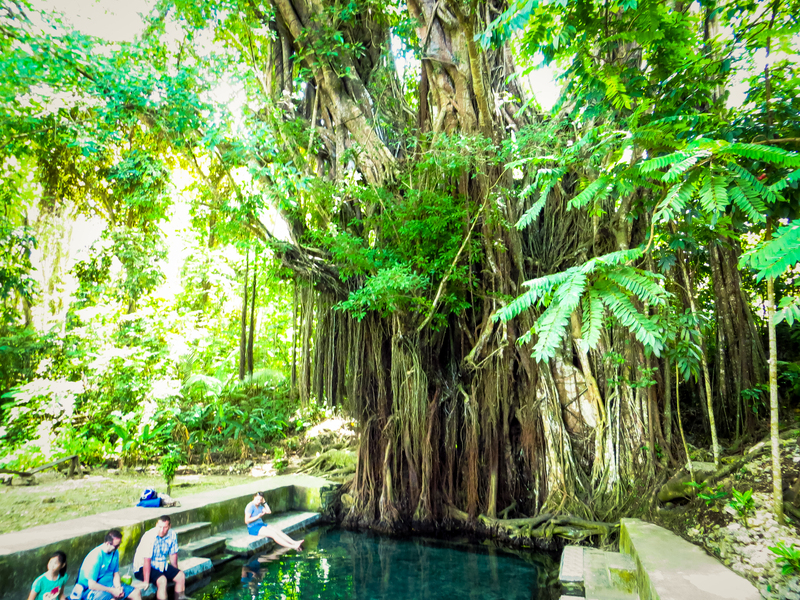 1st stop: Big Balete tree with fresh water pond – get a coconut drink and dip your feet in the cool waters for a free ‘fish spa’… They nibble at your dead skin (P5 entrance). 2nd stop: Old Church and other building in Lazi (on way to falls). 3rd stop: Cambugahay Falls. The water is a perfect, alluring blue. Welcome reprieve from the heat. You can jump into the pool, there’s also a swing (parking P10). 4th stop: Lunch at Salagdoong beach resort. There’s a restaurant, small beach, picnic spots, and best of all, cliff jumping spots into the sea. The whole route is really scenic; you pass through some villages, you see the farmers tending to their lands/rice fields, and you ride along the shoreline at many parts. On our way back, when passing the port, we decided to buy our ferry ticket back to Dumaguete, just so that we secure our seats and don’t have to worry about it. Luckily we planned, because the ferries don’t run that often on Saturdays! We booked with Ocean Jet, P210/person leaving at 1:50pm, and takes 45min (don’t forget the port fee of P10, and Ocean Jet also charges you an extra P20 for every big bag of luggage – cheeky). Make sure about the departure times of your ferry. It might be cancelled due to engine/boat problems or adverse weather conditions. Keep this in mind when planning on returning with a ferry and having a flight on the same day. On Saturdays Ocean Jet only goes at 10am and 1:50pm. Apparently there’s also a slow car ferry that can be taken. 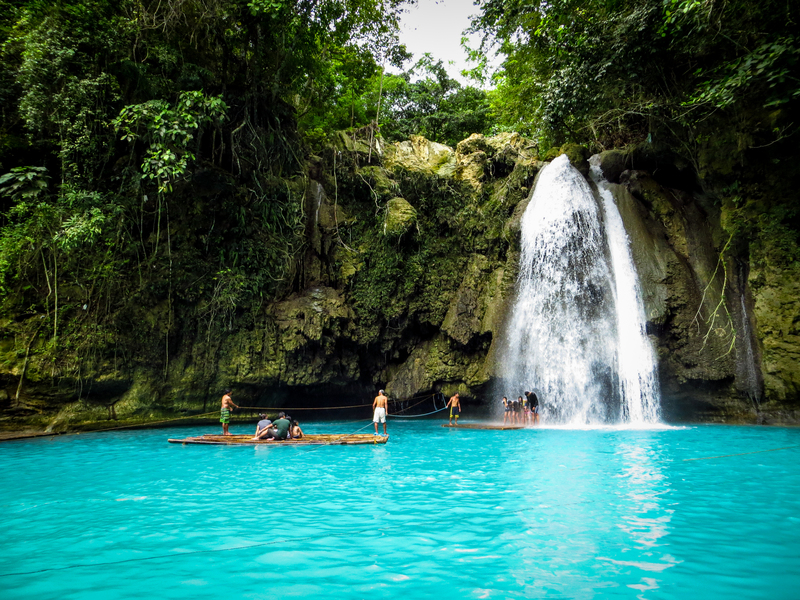 Other activities that should be considered on the island – visit Lusagnon waterfall (ask directions! 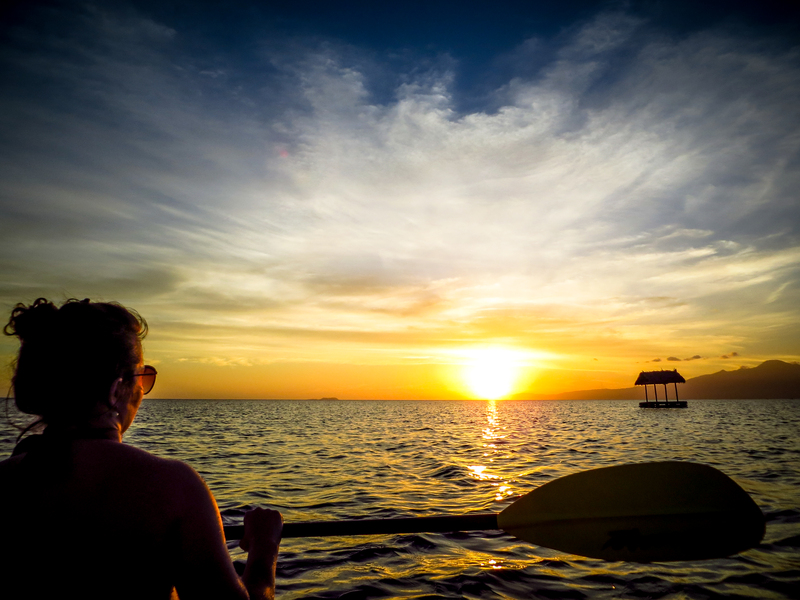 ), snorkel at the various marine sanctuaries, kayak to get a different view of the island, suntanning to heart’s content. – Breakfast on a smallish ‘cliff’ with spectacular views over the ocean at Royal Cliff Resort. – Eat at Dagsa restaurant: after our first meal there, we almost went back for every other one (this is in the San Juan area). 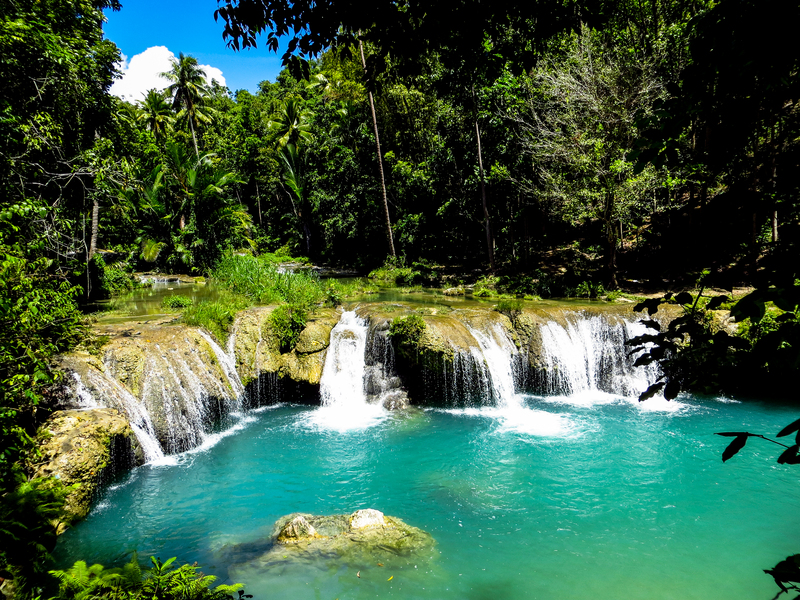 Siquijor is a place where maximum relaxation is the main goal. 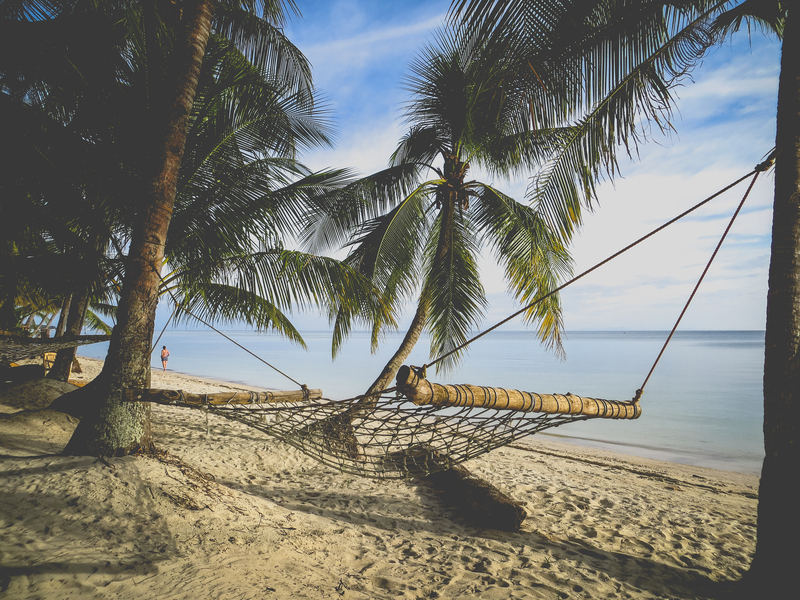 Kick out the flip-flops, don those sunnies, get a book (or drink), stretch out on a hammock, or if you feel a bit more enthusiastic take out the kayak! This is where you go where NO ONE will judge you for doing absolutely nothing… Enjoy! 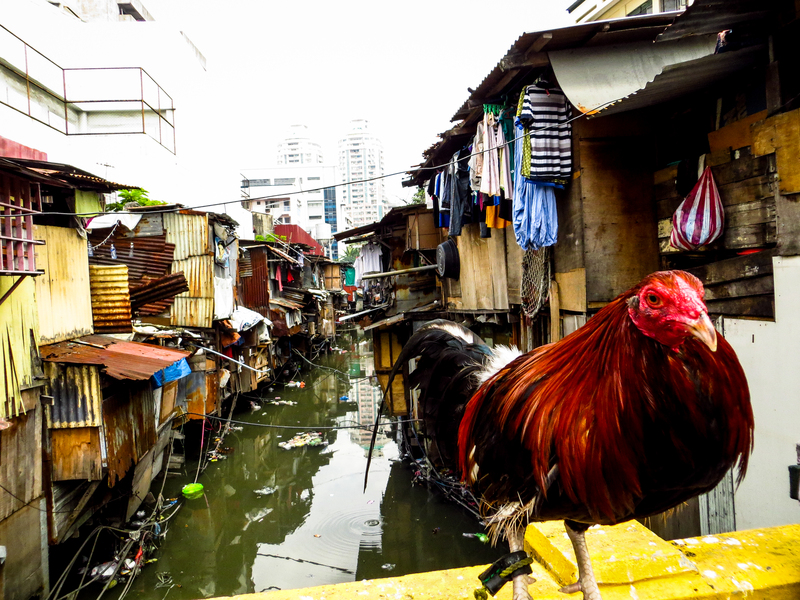 I just came back from the Philippines a few days ago. Your post brings back so many nice memories 🙂 I really enjoyed reading it. And your photos…wow…really beautiful! The color of the water is surreal! Jip, really awesome to see! I have been in Moalboal as to I am having school in Cebu. I’ve been there for a vacation. Another nice site is the Simala Church here in Cebu. Check it out. Wow, that Simala Church looks pretty impressive judging by the pics I see online! Thanks for the tip, next time for sure. Stunning photos and great information! Thanks so much for sharing!! 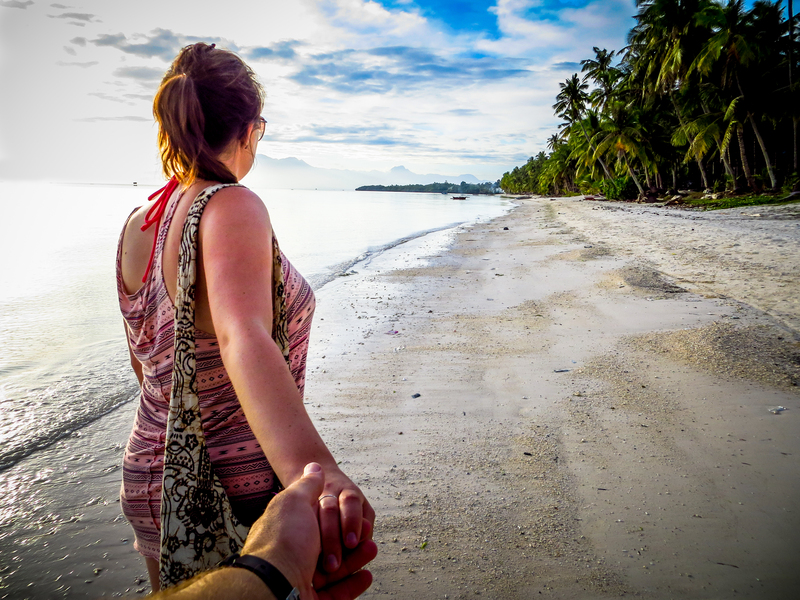 I am doing a very similar trip with my fiance in two weeks – except we’re flying in to Cebu City so going directly to Moalboal from there, and then doing Siquijor after just like you. So excited!! Question — did you like your accommodation in both places? Still booking ours and looking for a rec! Hi, sorry for late reply! 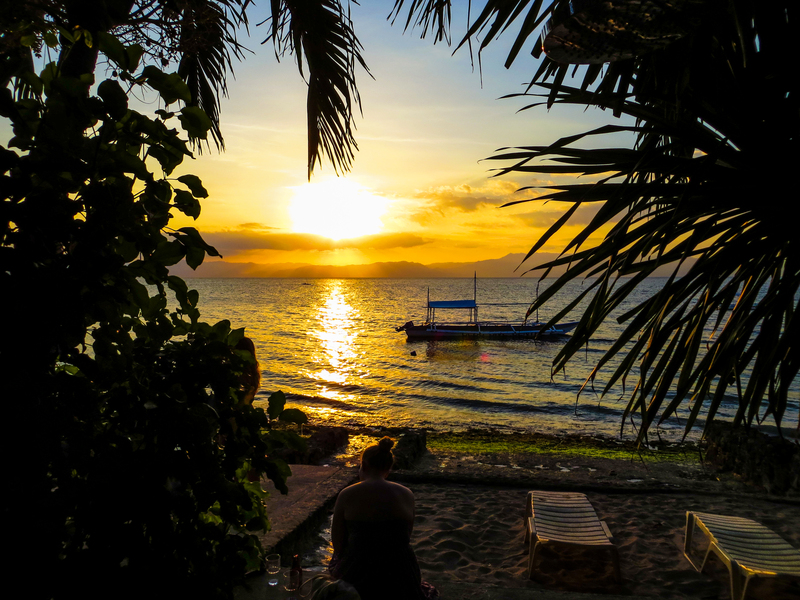 Enjoyed both places we stayed – Moalboal was strictly for scuba, so didn’t expect anything great, but was plain and simple, with awesome hospitality. 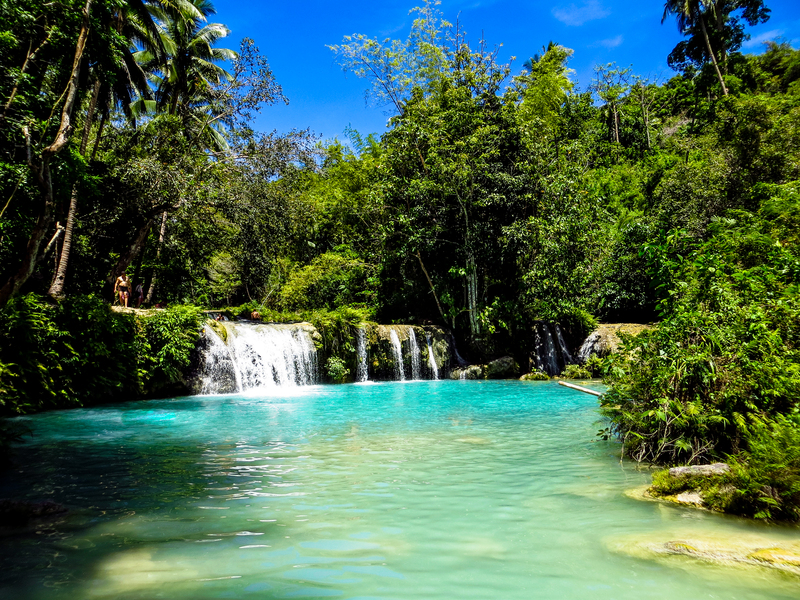 Siquijor, wow, amazing place, bungalows are all wooden with nice porches, nice island vibes which are very suitable for the location 😉 Enjoy! Hi Richard, sorry for the VERY late response – we’ve been back in South Africa, and have been settling in at our new home. We have 8 month old twin girls who also occupy most of our time now 🙂 I’ll throw you a mail, cheers! Very helpful blog. Thank you for sharing, your time is much appreciated. Happy travels.